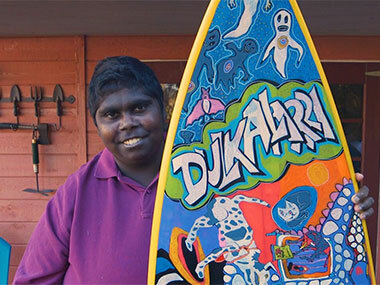 Claudia Moodoonuthi at her studio in Brisbane with 'Surfboard', (2017). Photo courtesy of the NGV. The second generation of the acclaimed Bentinck Island artists – famously lead by the late Sally Gabori – is emerging with its own distinctive style. Just like Gabori, who covered canvases in huge blocks of radiant colour in order to tell the story of her exile from her homeland to neighbouring Mornington Island in the Gulf of Carpentaria – so Claudia Moodoonuthi launched her career at Brisbane's Woolloongabba Art Gallery in 2012. Now she's being given a solo show at the National Gallery of Victoria entitled 'Coya - Little One', which is an exclusive new body of work inspired by her childhood on Bentinck Island in the Gulf of Carpentaria. For, as Gabori's generation were carted off their home island by the missionaries in the 1940s, the art they produced gave them the funds to return with their distant offspring like Moodoonuthi. She was actually raised by her late great-grandmother May Moodoonuth, an artist herself who worked with other Kaiadilt mentors, Mirdidingkingathi Juwarnda Sally Gabori and Netta Loogatha. ‘These new works by Claudia Moodoonuthi celebrate her vibrant practice and will challenge visitor’s perceptions of contemporary Indigenous art,’ said Tony Ellwood, Director of the NGV. 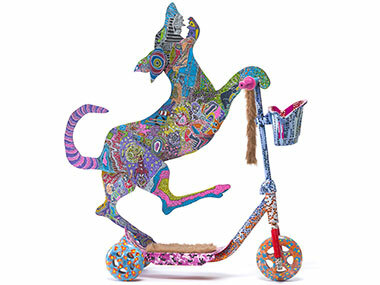 For Moodoonuthi has collected once-loved, found objects including children’s boots, a guitar, a surfboard and a rocking horse and transformed them into kaleidoscopic sculptures imbued with humour and stories of family. In her energetic and playful style, Moodoonuthi combines her love of urban street art with her cultural memories. These sculptures build on the painting practice she started with, using May Moodoonuthi's innovative and colourful painting style in her work. Although she was born on Mornington Island in 1995, Moodoonuthi went early to Bentinck when, as she put it, “Nana got dad’s land rights royalty and got all her grandchildren bikes and scooters. The dogs like Bluey would come running behind us", she added, explaining why she's now portrayed a dog on her scooter. Regarding the trolley, Claudia tells us, “‘I always liked to learn. Spelling was my favourite. There were little cards in the back of my trolley to read, and I would carry my slingshot, shell necklace and oyster rocks in the back. We used to ride the trolley down to the boat ramp on Bentinck and see who could get the rocks furthest out. It was lots of fun and ‘Snowy’, the blue heeler would always jump on the back with me". It was a fun but remote life – requiring Bentinck residents to be self-sufficient apart from the occasional barge drop on a neighbouring island. “We had to wear boots or thongs when we went to Sweers to buy things as it had a shop, and Bentinck Island did not. The barge would drop our supplies off at Sweers, so we all went over by boat to collect them”. Later she relocated to Aurukun on the Cape York Peninsula in 2003. 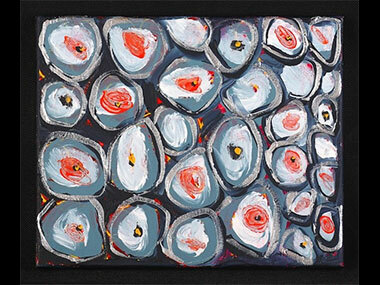 In 2012, she was the winner of the Gold Coast Aboriginal and Torres Strait Islander Art Award and held her first solo exhibition Claudia’s Story, at the Woolloongabba Art Gallery, Brisbane, where she now lives. In 2016, Claudia Moodoonuthi’s work was featured in Who’s Afraid of Colour at the NGV Australia, an exhibition which showcased the works of over 100 Aboriginal women artists. Claudia Moodoonuthi: Coya - Little One will be on display at the Ian Potter Centre: NGV Australia at Federation Square until February 2018. 'Dog on scooter' (2017), Brisbane. Pen on scooter, carved dog and kangaroo skin. Purchased with funds donated by Jo Horgan and MECCA Cosmetica.